Before AsureForceT Time & Labor Management Solutions, Nixon Peabody managed the benefits enrollment of its 1,700+ employees with paper forms. This paper-based solution created unnecessary processing costs and overhead for the HR department. 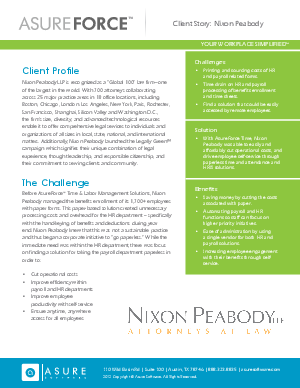 In this case study, you'll discover how Nixon Peabody cut operational costs, improved efficiency within the payroll and HR departments and improved employee productivity with self-service with the help of AsureForceT Time & Labor Management Solutions.